1) We are holding a Generations event “Stand Like Stonewall” at Manassas Battlefield on Saturday, April 1. At this event, participants can choose their side, get in line and march on the very ground where these events transpired. Some lucky kids will even get to don the uniforms of their choice! This event is designed to connect younger and older generations while exploring our country’s history. You can bring your son, daughter, niece, neighbor, or friend and help instill a lifelong passion for learning. 2) In the spirit of the Generations format, I will be heading to Manassas Battlefield to hold a Facebook Live event with one of the younger history fans I know. He’s a budding Civil War aficionado whose knowledge surpasses mine at that age by leaps and bounds! We’ll chat about the Battles of Manassas, a general getting his nickname, share our generational perspectives, and we might get a short demonstration of some Civil War drumming! 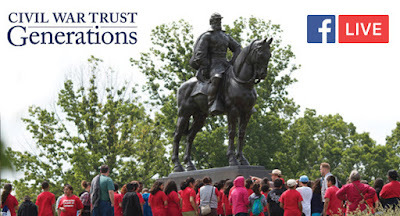 To join this virtual event, head to the Civil War Trust Facebook Page on Friday, March 24th at 12:00 p.m. Eastern. Feel free to ask questions in the comments section about the Generations event, the Battle of Manassas, or the land that we have preserved at this seminal battlefield. And in case you can't make it, the video will be on our Facebook page thereafter. I should also mention that the Manassas Generations event will be held in conjunction with Park Day, the Civil War Trust’s annual hands-on preservation event. On Saturday, April 1, volunteers across the country head out to historic sites and battlefields to help with maintenance projects large and small. You don’t need any experience to join, and your effort will make a difference for years to come. Generations event attendees are not required to participate in Park Day, but it is certainly encouraged. See you on the battlefield- either virtually or in person!